Charge your iPhone in style, with the new Nomad leather wallet charger for your iPhone 5-iPhone 7. The Nomad leather wallet charger offers a classic rugged style, a built-in battery pack and superior leather quality that actually patinas over time. This gives the wallet a unique, one of a kind look that becomes like no other wallet that is currently out on the market. The nomad case not only has that old western, natural look, but it is also very compact and powerful. The wallet sports an advanced SoC (system on chip) microprocessor, and 01005 grade inside components which allows it to house a whopping 2400mAh battery. This helps provide fast, dependable charging for a full long-lasting battery life. Another great thing about the Nomad wallet charger is that, it also features a RFID blocking protection, reinforced battery housing, 6x card slots, plus 2x storage pockets and a special cash pocket compartment to store all of your cash and coins in. 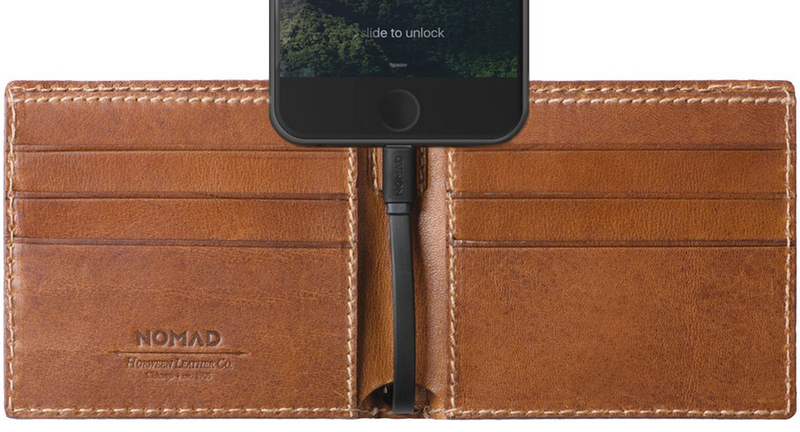 If you’re interested in buying the Nomad leather charger wallet for your iPhone, you can head on over to Nomad.com where its current asking price is $149.95, with free shipping and handling.